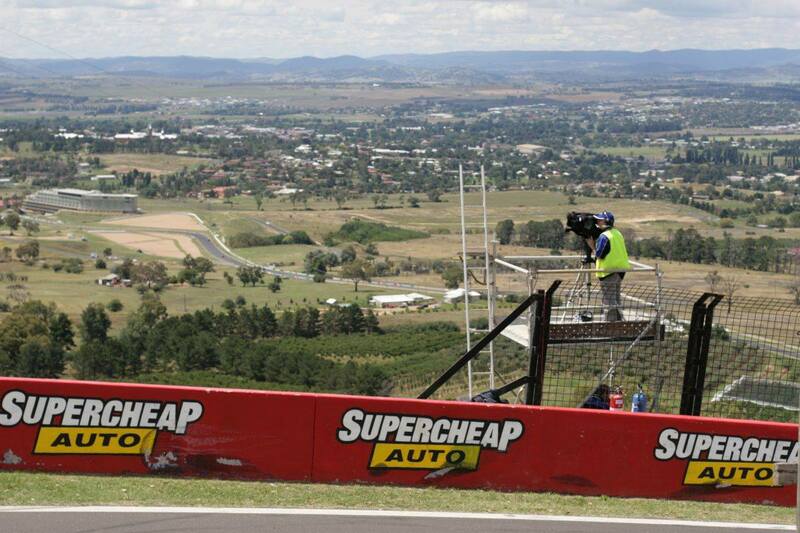 Being a typical Aussie racing driver, I've always wanted to race at Bathurst. 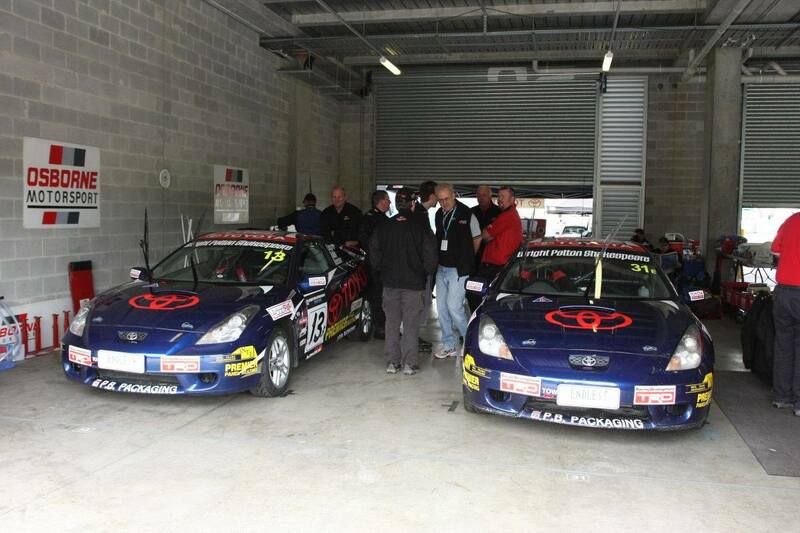 That chance came up in February 2008, again driving with the Osborne Team, who I drove for in mid-2007 at Nürburgring. Here's the #31 Celica at the Team Osborne workshop in Sydney. 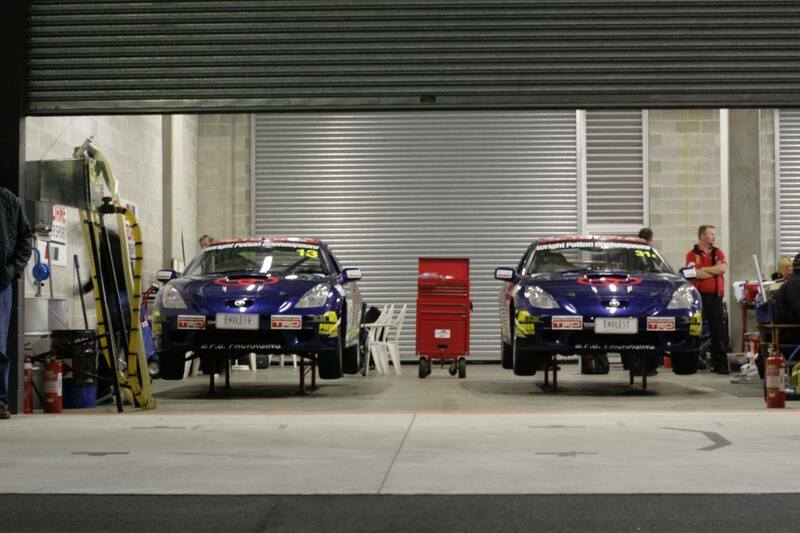 The ever hard-working Dave & André are making the final preparations to the cars before they head up to Bathurst. The rules has recently changed so we were able to remove a few interior panels to save weight. 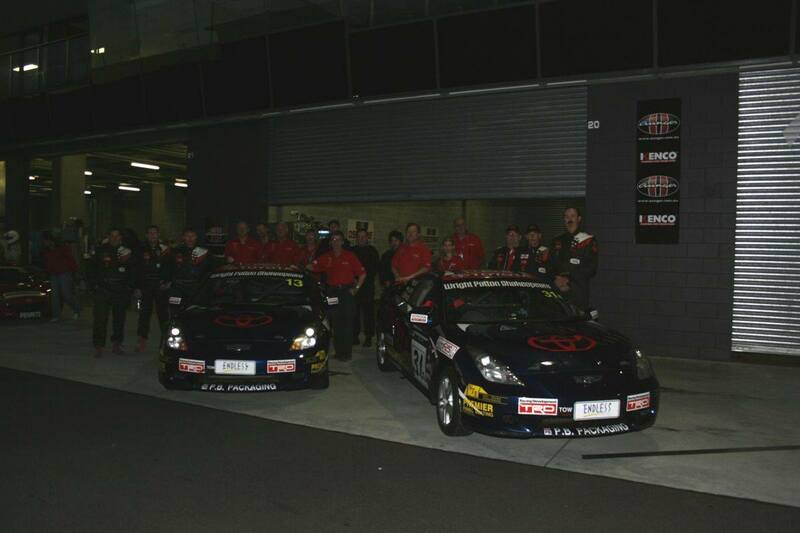 On the right is the Mt Panorama pits, with most of the crew having a quick break after setting up the garage. 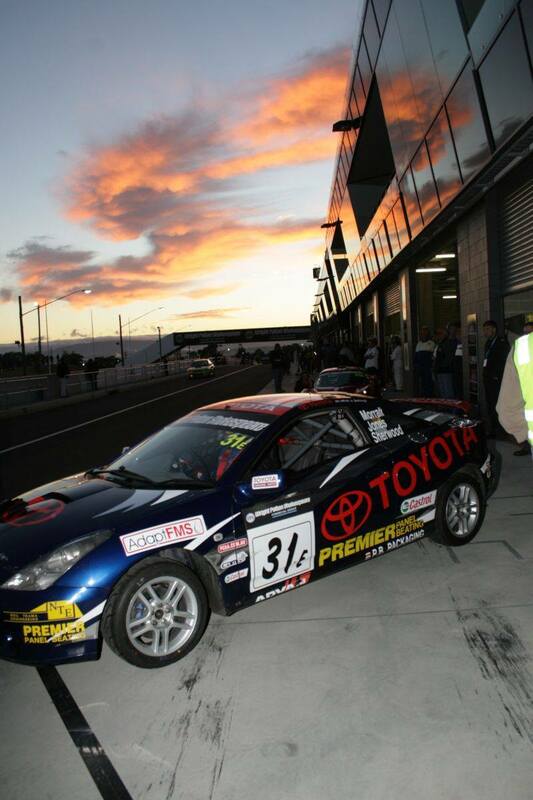 Mt Panorama is quite steep and the view from the top is spectacular. On the left you can see from Skyline Corner down to Caltex Chase, where our Celica's would take the right-hand corner at around 230km/h. The tyres used on the cars are soft Yokohama street-legal semi-slicks, and to ensure they don't get out of shape at all the cars are lifted up off the ground each night. It looked like a good day ahead with a slight chance of rain later on. I don't have a good photo of the team all together, the one on the right is the best I could do and it's a bit dark sorry. The Mount Panorama pits came alive with the sound of cars well before daylight, as the race was scheduled to start at 7am. Neal Bates was to pilot the #13 car for the first stint and after some discussion Stuart was to take our car off the start line. The forecast was for clear skies but with the chance of storms in the afternoon, but we were using the same tyres regardless of the weather and our strategy also remained the same. The entire field of forty-odd cars wheeled out of the pits to do a slow lap then form up on the grid. But as fate would have it the only Hyundai in the field was just starting its run down Conrod when a kangaroo jumped out in front of it and got bowled-over. 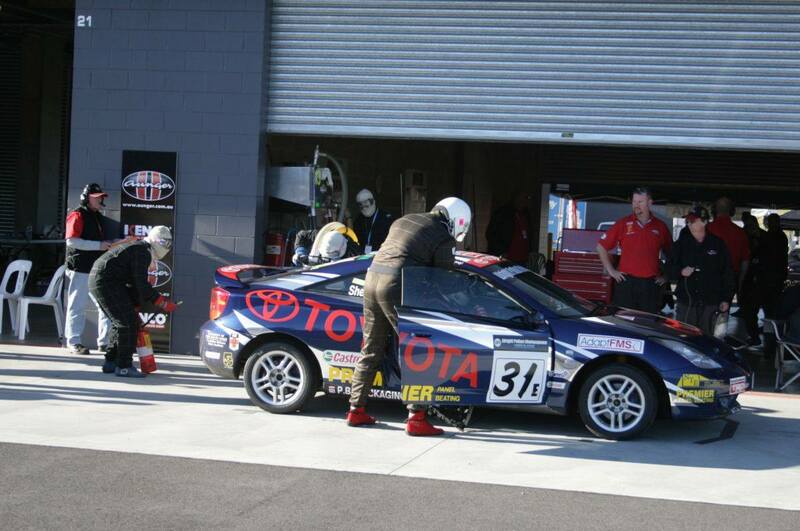 The car suffered little damaged – nothing that a bit of race-tape couldn't fix – but the roo took some time to sort out. After a bit of a delay the cars all moved off behind the Alfa Romeo safety car for the warm-up lap, then were lined up on the grid. With the drop of the Australian flag the cars were off for the twelve hour endurance test. The more exotic cars sprinted off up the mountain, closely followed by the 'regular' cars. We had a big telly in our pit and the track was televising the entire event so we had a superb view of the cars as they wound their way around the circuit. Right from the start, it was obvious that the turbo Lancer's and BMW's were going to sprint all the way and none wanted to accept 2nd place. Batesy held the class lead from the quick Honda's and gradually pulled out an increasing gap. Stuart kept it clean and circulated around also very well. All too soon the first cars were making unscheduled stops to fix their various gremlins ... Bathurst can be a cruel place. 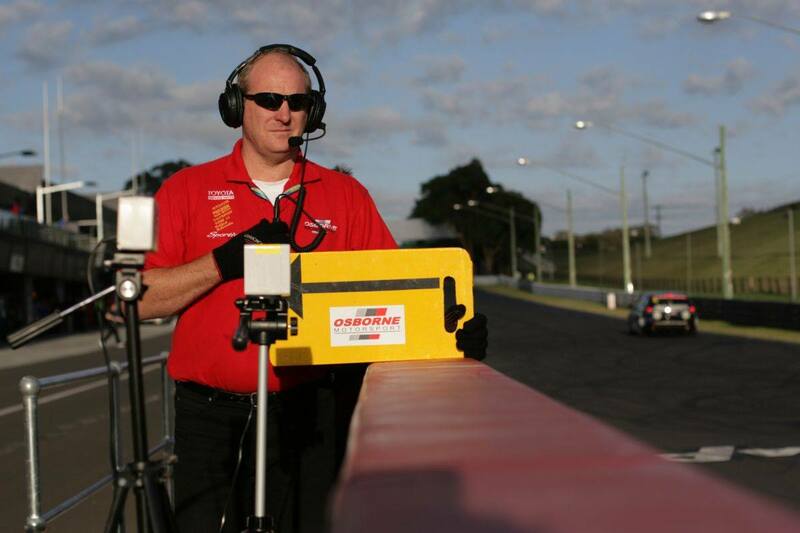 We had radio communication for nearly the entire lap and both drivers reported our cars were running like clockwork. All the other drivers seemed to be well-behaved so it looked like it was going to be a clean race. There was one other Celica like ours in the race and it had a good turn of speed, splitting our two cars so we were going to have to try to run it down in our #31 car. The screaming Honda's also were our match in straight-line speed but we had them around the corners. Unfortunately it's very hard to pass around any corners at Bathurst so a bit of clever tactics was required – Fortunately Team Osborne is very experienced at that. 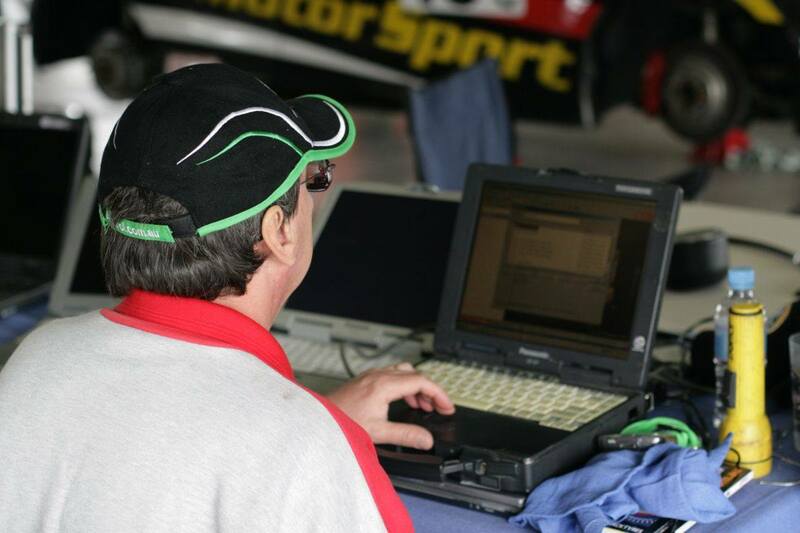 The team is expertly monitored by Neil Trama, seen on the left in his usual place .... at the laptop examining race data. Neil is very hard to pin down and that's the best photo I have of him. On the right is Dave, calling one of the cars into the pit. Dave is wearing the radio headset used to communicate with the drivers. All too soon it was time to get into the racing suit and get ready to race. Stuart brought the car into the pits and stopped right on the mark, the team quickly plugging in the fuel and checking the tyres. I ran around to help Stuart out of the car, then he helped me get the seatbelts done up and plug in the radio gear & drinking tube. Keith pulled away the pit board and away I went, out of the pits and up Mountain Straight – For a grand total of about one lap! I was barely settled down in the car when the safety car pulled out and the entire field had to slow down behind it. As we slowly drove up to Griffin's Bend, the reason was clear – The Holden Commodore Sports Wagon was well and truly nosed-into the tyre barrier and wedged in with it was a red Lotus Elise. 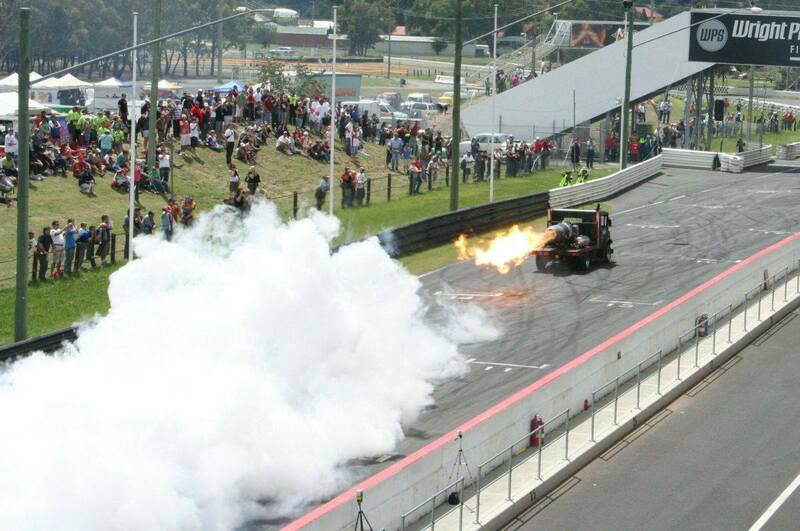 The Holden's brakes had completely failed into the corner and somehow the driver, Cameron McConville, had managed to wash off a lot of speed to minimise the impact. But he couldn't avoid getting tangled up with the Lotus – The Lotus was back on the track later though, one corner covered in red race tape. And so for the next twenty minutes or so we idled along behind the diesel Alfa safety car, and so I finally got to do those slow laps around the track that I wanted to do days before. All the kerbs and bumps got a good eyeing-over so I could see where I could perhaps get a small improvement in lap times. The team kept in radio contact with us and shortly after the tyre barrier was restored Dave radioed to us that a restart was imminent so I got the revs up to warm the engine again and worked the tyres to judge their grip. Across the start line, I was surrounded by the faster cars and they rushed past me in the dash to Hell Corner then even more up Mountain Straight. The pace soon settled down and although the speed of the cars varied a great deal the Celica's were very fast across the top of the mountain; Only a small handful could keep up with us, let alone pass us. Nearly an hour into my two-hour stint, the amber ABS FAIL light came on. Within minutes Colin reported the same thing in the #13 car. They still stopped just fine as we weren't using maximum braking because we were stopping at a lesser rate that would make the brake pads last the full twelve hours, so the ABS wouldn't normally kick in anyway. But, as is sometimes the case, this too would catch us out later in the race. The cars were otherwise perfect, just circulating around and around faultlessly – They're a delight to drive as they still have most of the gear that a regular road car has, as if they were stripped down as much as the rules allowed they'd be very under-weight. So the power steering and electric windows were still there to make life easy for the driver. Hmmmm .... no radio or CD player to listen to though. 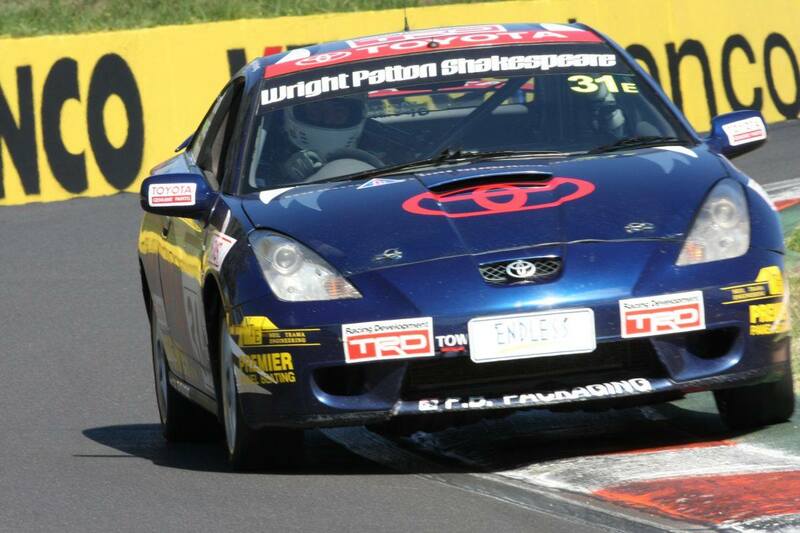 On the left is me coming up to BP Cutting in the #31 Celica. It's taken in 3rd gear then the throttle is held flat from there all the way to the braking point for Skyline Corner. On the right is my serious face .... ! Now I wish I could pass on tales of epic dices and stunning laps, but our cars just kept on circulating around lap after lap with a minimum of fuss. I finished my first stint and gave Hadrian a good car, which he passed back to Stuart who also ran around without fuss. The only drama for the #31 car was later in the race, when Hadrian was setting the car up for the entry into Skyline and the car right behind him though he was being let through, so ducked to the right-hand side and pushed Hado even further out. He had to get on the brakes hard and then start an awkward turn-in, then the lack of ABS caught him out and the car started to spin but was caught in the big sand trap just over the crest. He must have hit the sand sideways at over 130km/h but by an amazing stroke of luck the car didn't roll as it came to a rapid halt with the left wheels buried deeply. A group of us were watching the race on the TV and it took a couple of seconds for it to register than the car firmly beached on the screen was ours – It must have been, it had my name on the side! We got on the radio and told him to not bother to try to drive it out as it was bogged too far, then watched as it took an agonising amount of time to get a tractor hooked-up to tow him out. He made it back to the pits okay and the car also seemed fine so out he went again. There was a small vibration and he said it felt a little odd but it still drove all right. 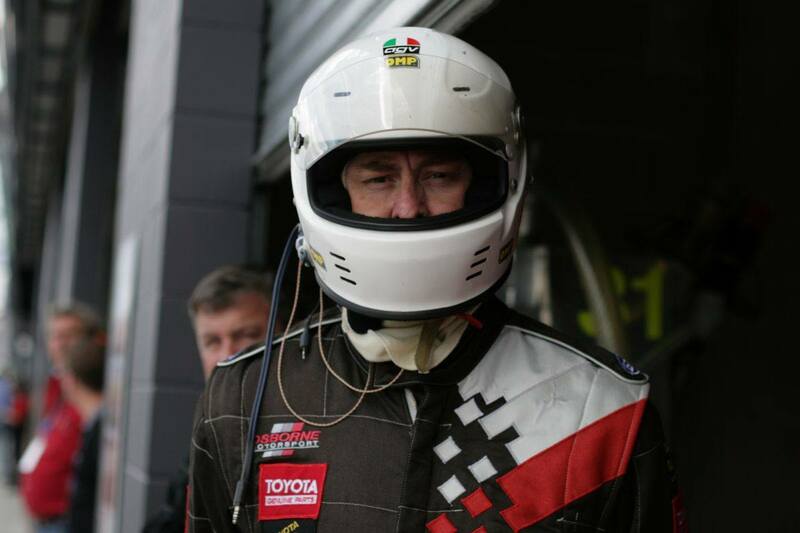 My 2nd stint was shortly after and the car definitely was not as sharp as it was in the first stint. I was struggling to get into the 2:51 lap mark than the team wanted and most laps were around 2:53 odd. It was depressing, as the #13 car was still running around in the 2:46's. In only a few laps I saw Batesy close up in my mirrors, then just waltz on past effortlessly. One marked difference with the 2nd stint was the lack of traffic. There'd been a few casualties and the cars were well separated, so at times I was able to do something like four or five laps and I'd be the only car around. Nothing sighted out the front windscreen, nothing in the mirrors. The flaggies weren't waving red or black flags at me so I figured the race was still on. Then a gaggle of Evo's, WRX's, and BMW's would rush past and I'd be by myself again. The car I also saw frequently was the Hyundai, it felt like I passed it about ten times in total but as it turned out it was just the timing of the pit stops that had us seeing each other often. Only a few hours to go in the race there was a collective gasp from everyone that could see a TV – The blue Thrifty Mazda had just torn itself to pieces as it rolled over and over again through The Chase. Everything and everyone in the pits stopped to watch, glued to the screen, then a wave of relief went through us all when Len Cave got out of the demolished wreck by himself. The crash was played many times and it was truly sobering & reminded us that this is a game we play for keeps. Not too long after that John Roeken radioed to the pits that he had a flat tyre and was coming in. He pulled up with a shredded front-left tyre and the crew changed it quickly. He told us that just as he was going through The Chase the tyre let go .... I don't know how he managed to hang onto the car but he must have done an amazing job getting it all back under control. He stayed in the car to cross the finish line in 1st place and 11th outright. 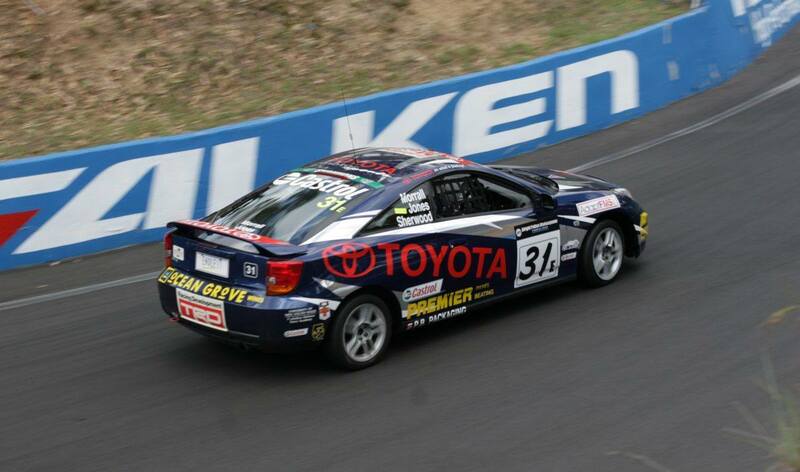 The #31 car crossed the line 4th in class and 16th outright. We'd also beaten all but one of the big V8's – they had constant problems with rapid tyre & brake wear and this slowed their overall times greatly. Our little 1.8 litre cars had taken on and beaten some much bigger and faster cars, and this was due to the professionalism of Team Osborne. There was also quite a lot of other entertainment on the weekend, with a bunch of very talented guys on motorbikes doing some amazing tricks. 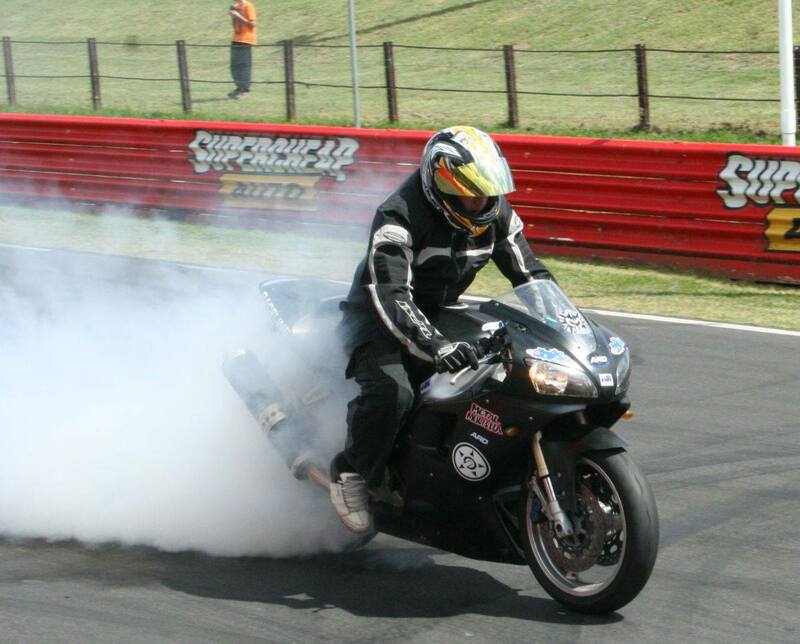 The guy on the left was able to ride along whilst smoking-up the rear tyre nicely. Others were doing wheeelstands, whil sitting on the handbars. 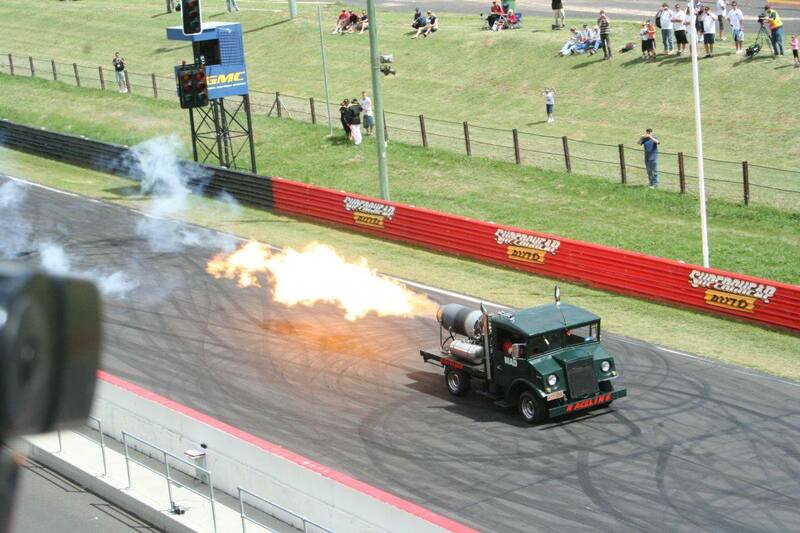 On the right is an old truck that came along, and it had an equally old jet engine strapped to the tray. 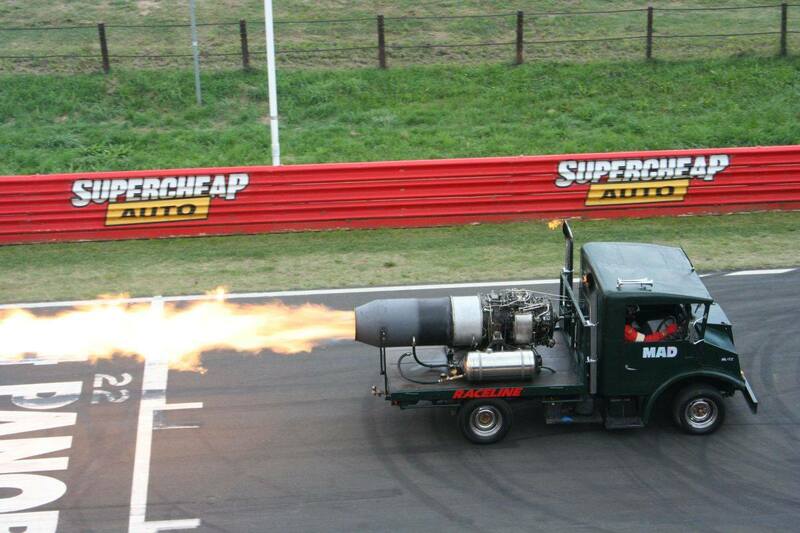 This was the best thing - apart from the race - on the weekend as the jet engine had a crude afterburner added to it and when he lit it up the BOOM would rattle the windows all around. The flames that came out the back would had to have been at least ten metres or so long, and even though I was standing a reasonable distance away I could really feel the heat. I was able to get a copy of some of the datalogging of the qualifying laps, and in the picture to the left you can see my speed trace (in black) overlaid on Neal Bates (in green). The run starts just after the start/finish line so the first dip in speed is Hell Corner then up Mountain Straight. I'm nearly as fast as Neal up to Griffins Bend, where he's faster, then he holds that higher speed up the mountain to BP Cutting - where I'm a touch faster - then again the speed is similar until Reid Park were Neal must take a better line through it than I do. The rest of the run across the top of the and then down mountain has us again doing similar speeds, right up the about halfway down Conrod Straight where he again pulls away in 6th gear.. From there on again our speeds are similar but over a full 6.2km lap the little differences here and there add up to Neal being nearly four full seconds faster. I also managed to get my video camera into the car for some qualifying laps, and here it is on Youtube. Keith, Dave, André, Neil, Ian, Trevor, Chris, Rod, Michael (most of the photos here are from him), Sue, and Sue, and all the others who made it possible and enjoyable!